The term Advent — “Adventus,” in Latin — reminds us that something is imminently coming. As a child, my sense of that imminent coming laser-focused on Christmas Day and the gifts that I knew I would receive. My focus, actually, was more on the gifts than on anything else. That Advent is about Jesus Christ may sound commonsensical to well-catechized Catholics. But let’s be honest, many Catholics out there seem more concerned during Advent about gifts and shopping and fancy meals than on anything that has to do with Jesus Christ. I learned that Christians are permanently waiting for Jesus, longing for his return on the last day. We constantly say, “Come, Lord Jesus.” During Advent, we intensify that plea. What do we do while we wait? I think that the Advent tradition of “las posadas” among U.S. Hispanic and Latin American Catholics gives us a good clue: Practice Christian hospitality. The tradition is inspired by the biblical passages describing the journey of Mary during the last days of her pregnancy, and her husband Joseph searching for an inn (“posada,” in Spanish) to stay. Many places rejected them for various reasons. Eventually they found space at a stable. Las posadas are often structured as an Advent novena. Each day Mary and Joseph, usually children playing those roles, go to a home or to a group searching for a place to stay. The sojourners sing a popular tune. After several rejections, they are finally welcomed in one place. Then everyone prays and celebrates with a profound sense of fiesta. Two things we learn from las posadas during Advent. One, life is a long and complex journey that often places people in difficult situations. Their last resource many times is the openness and generosity of others who are better off. 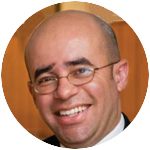 Hosffman Ospino is professor of theology and religious education at Boston College.